CSE Chairman Krishan Balendra will step down from his post on completion of customary three-year term. Vehicle imports from Japan to Sri Lanka has dropped behind India in 2013, according to a report issued by the Ceylon Chamber of Commerce. A discussion between Ms. Lesego Ethel Motsumio, High Commissioner for Botswana and Basil Rajapaksa, Minister of Economic Development has taken place recently at the Ministry of Economic Development. An inventive mum in China has created soap made out of breast milk that is proving to be quite a hit. A new range of headphones have been created exclusively for women after recent research has proven that males and females hear differently. 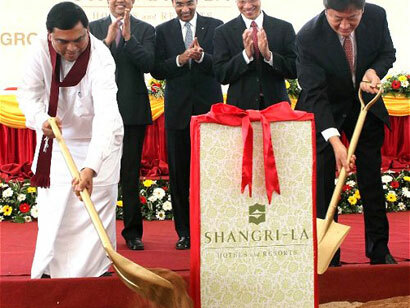 The earlier plans for the construction of a hotel opposite the Galle Face by the Hong Kong based Shangri-La Group have reportedly been changed and according to the new plans even the high tension electricity lines running across the area have to be relocated. Land Rover, which is synonymous with the game of rugby, has joined Trinity College Kandy as the Principal Sponsor for their Rugby season of 2014. The Commercial Bank of Ceylon has been ranked the third most valuable brand in Sri Lanka in the 2014 rankings compiled by Brand Finance Lanka and published in the LMD Brands Annual for the year. China has continued to push a new economic initiative of building a ‘maritime silk road’ linking the Indian and Pacific Oceans, in an apparent attempt to counter regional anxieties about its fast-expanding naval presence, ‘The Hindu’ reports. President Mahinda Rajapaksa declared open the Sri Lanka's first and only motor car assembling plant of the Micro Car Private Limited in Polgahawela export processing zone last morning (April 18).